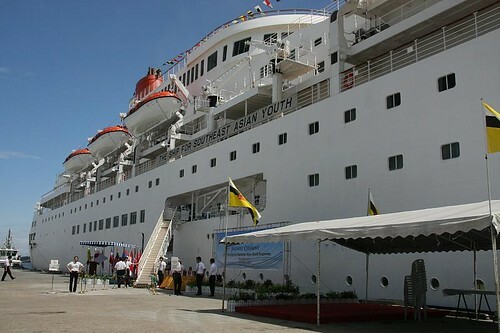 Take a luxury cruise liner, fill it with some 300 vibrant youths from Association of Southeast Asian Nation (ASEAN) members and Japan, stir in cultural agenda and social interactions. The result: a strong bond and lifetime friendship. This is the story of the Ship for Southeast Asian Youth Programme (SSEAYP) or ‘Program Kapal Belia Asia Tenggara’ on the M. S. Nippon Maru , funded by Japanese government in fostering friendship between youths of ASEAN and Japan. “to promote friendship and mutual understanding among the youths of Japan and Southeast Asian countries to broaden their perspective on the world, as well as to strengthen their motivation and abilities in international cooperation by participating in discussions, introductions of each country, and various exchange activities both on board and in the countries to be visited”. Youths on board take part in activities such as: discussion programs, solidarity group activities, club activities, giving of introductions about home countries, delivering and listening to lectures, and socialization activities. They act as mini ambassadors of their home countries as the ship stops at every Southeast Asian nation to give courtesy calls, attend receptions and participate in institutional visits. Some would get immersed into other cultures through homestays and interaction with local youths. ‘We are indeed very lucky to be selected for the program and there is great emphasis on selecting the best of the best, as the real purpose of the ship is to learn. After participating, I definitely felt that friendship was very much enhanced, and many bonds were created. The impact of the whole trip has been profound according to the blogger, that has allowed her to visit her fellow participants recently in Kuala Lumpur, Malaysia. She was able to make many official visits and courtesy calls through the programme that led to many chances of networking. I would certainly never have spoken to the owner of the Vietnamese  factories if I was not in the programme. Who knows…. one day I want some investors, I know just who to contact. My friends, who were young entrepreneurs were very excited for this aspect of the programme. Also the homestay was phenomenal. In Indonesia,  she stayed with an inspiring politician who raised her kids alone after her husband died. In Bangkok , it was this really rich man who manages a Thai bank who really taught her a lot! I could never imagine that kind of friendship without the programme. It is difficult for us to part. Memang payah kan becarai!!!!!! Kalau bulih kami ani mesti tah bejumpa setiap hari. Cerita nda pandai habis eventhough we've been spending the last 6-7 months together??? Difficult for us to part. If possible, we must meet everyday. We can never finish sharing our stories eventhough we've been spending the last 6-7 months together??? M.S Nippon Maru sets sail for the last time before making way for a new ship next year. Brunei's involvement started in the early 1980s first as an observer, then as actual participant. Every country is given a quota of 28 participating youths (PYs) consisting of 14 girls and 14 boys, and 1 national leader (NL). To join the program, each country has different criteria. For Brunei, you need to be single, between 18-30 years of age, preferably active in any youth based activities/organizations, and has talent in the performing arts. greatly signifies the dynamic spirit of Brunei Darussalam ex-participating youth (ex-PYs) in their true aim of fulfilling the SSEAYP Objective of strengthening existing friendships with their young contemporaries in the other nine ASEAN countries and Japan. AMAZING EXPERIENCE!!! Nippon maru is the ship of dreams! Stories like this no doubt bond youths and most importantly create a greater understanding between different cultures, religion and societies as well as the future leaders of ASEAN and Japan together!